You can solve all your problems by freezing them! Applied Cryogenics is a cryogenics lab in New New York. For over a thousand years it has provided safe storage environments for humans to sleep for lengths of time that may exceed a million years. This long-term uninterrupted stability seems quite an achievement considering the careless handling of the chambers, their last power shortage being in 1997, and the fact that they have survived two destructions of New York as well the second coming of Jesus. The daily routine for staff of Applied Cryogenics is centred around waiting for another of their customers to defrost, and making sure that their chambers work properly until that time comes. Once a defrostee is awake, they are scanned, poked and prodded by the probulator at the Fate Assignment Office, and it is soon determined whether they have any family and what they will do for the rest of their lives. They will then be implanted with their career chips. Among many others, Applied Cryogenics has frozen people such as Philip J. Fry (three times), his ex-girlfriend Michelle, actor Pauly Shore, polka singer "Weird Al" Yankovic and (possibly) Steve Castle. Staff have also been known to freeze people who have come to be a problem for them, and occasionally use the chambers as fridges. From the very beginning of the script for "Space Pilot 3000" was the purpose of the Applied Cryogenics company sealed. It was meant to be the gateway for Fry to get to the year 3000. However, exactly how he got there, and what happened afterwards changed a lot during the editing of the script. In an early version was Fry supposed to be a night watchman at the company. After waking up, Fry would either have been shifted to auction where the Professor bought him for organ supply or shipped to Ellis Island and get cut by the Statue of Liberty. However, it was decided it would be cleaner to have him meet Leela at the Applied Cryogenics, which may suggest Leela was originally written with a different past. The concept for the cryogenic plot as a whole was a general science-fiction cliché, that the writers decided to use as their method. Though, John DiMaggio does question whether the survival of the building during the destructions of New York is another secret, equal in measure to Nibbler's shadow, but David X. Cohen responds with it being so secret, that no one on Earth knows the answer. According to the animatic for "Space Pilot 3000", Applied Cryogenics' street address is 405 W. 43rd Street, and its phone number is 212-555-1221. At the time of Fry's freezing, they hadn't had a power failure since 1997. Since Fry survives for a thousand years, it can be assumed that they continued to not have a power failure for a thousand years (although the building itself may have been protected by the Nibblonians to ensure that Fry will be unfrozen at the year 3000). Applied Cryogenics has had such esteemed patrons as Pauly Shore and "Weird" Al Yankovic. The cryotubes seem similar to the stasis pods of the T.V. series Red Dwarf. The frozen man who hoped time was cyclical would be proven right much later in "The Late Philip J. Fry". It can be assumed that the cryo-tube timer is very slightly off, as Fry was frozen at midnight on 1 January, 2000, and it was set for 1000 years, meaning a 1 January, 3000 release, however he was released at least 7 hours early (5 pm, any later an the sun would be down in winter) on 31 December, 2999 (however, this could be explained by leap years). The Cryo-Tubes seem to have undergone a refurbishment in 3011, as seen in "Law and Oracle". 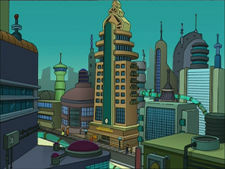 It's possible that the Planet Express crew took one of the old ones for the photo shoot in "Neutopia", as Fry poses in an older version of one. Terry: [dramatically] Welcome to the world of tomorrow!! Lou: Why do you always have to say it that way? Terry: Haven't you ever heard of a little thing called showmanship? [He turns back to Fry, and speaks dramatically.] Come, your destiny awaits! Ipji: This is unacceptable, Leela. You must find this Mr. Fry and install his chip. Leela: Look, he's just a nobody who doesn't want to be a delivery boy. I'd really rather not force it on him. Ipji: Well, that's your job, whether you like it or not. And it's my job to make you do your job whether I like it or not. Which I do, very much! Now get to work! ^ a b c Commentary for "Space Pilot 3000" on Volume One, disc 1. ^ DiMaggio, John. Commentary for "Space Pilot 3000" on Volume One, disc 1. ^ Cohen, David. Commentary for "Space Pilot 3000" on Volume One, disc 1.